A new report by the Center for Opportunity Urbanism, Beyond Gentrification: Towards More Equitable Growth, explores how unbalanced urban growth has exacerbated class divisions, particularly in the urban centers of our largest's metropolitan areas. To read or download the full report click here. First up, Pete Saunders takes a deeper look into Chicago in his essay, "Chicago: A Tale of Two Very Different Cities," which begins on page 18 of the report. Read an excerpt of his piece below. On its surface, the city of Chicago exhibits many of the characteristics associated with gentrification in the nation’s top global cities, like New York, Boston, and Washington, D.C. on the East Coast, and San Francisco and Seattle on the West Coast. It has a gleaming downtown booming with new construction; surrounding neighborhoods with large concentrations of young, educated and affluent urbanites; and dense, walkable areas adjacent to transit, retail, entertainment and institutional development that has sprouted to serve the rapidly rising demographic. 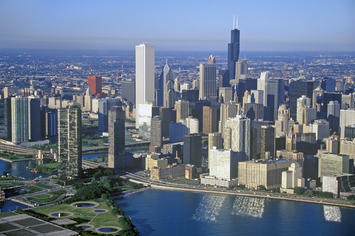 The revitalization apparent in the nation’s ‘superstar’ cities is visible in Chicago. A deeper look into Chicago, the Midwest’s largest city, as well as its economic and cultural capital, shows that it exhibits just as many traits commonly found in its surrounding area. It is at the forefront of revitalization in a region that still suffers from the loss of manufacturing employment and from rigid segregation patterns established during the Great Migration. Sadly, however, the policy tools designed to create a better city have rarely been used in an equitable fashion. Chicago’s broader gentrification pattern has been influenced by its legacy of segregation established in the aftermath of the Great Migration that brought African-Americans north from rural, southern states over the first half of the twentieth century. Early on, Chicago adopted a segregation strategy facilitated by the real estate industry, which was enforced by police and even mob violence. Chicago became a bifurcated city. The areas where the legacy of segregation was minimal thrive, and the other areas, starved of the investment that fuels growth elsewhere, lag. Pete Saunders is a writer and researcher whose work focuses on urbanism and public policy. Pete has been the editor/publisher of the Corner Side Yard, an urbanist blog, since 2012. Pete is also an urban affairs contributor to Forbes Magazine’s online platform. Pete’s writings have been published widely in traditional and internet media outlets, including the feature article in the December 2018 issue of Planning Magazine. Pete has more than twenty years’ experience in planning, economic development, and community development, with stops in the public, private and non-profit sectors. He lives in Chicago. Detroit, Why Hast Thou Forsaken Me? East Coast, West Coast – What about Our Coast? Can the Rust Belt Learn From Dixie?